According to our partners at OpenSecrets.org, “dark money” refers to political spending meant to influence the decision of a voter, where the donor is not disclosed and the source of the money is unknown. If voters don’t know where the money is coming from, they can’t know whether the campaign messages they hear are credible. Current federal law allows donors to make unlimited contributions to nonprofit groups and Super PACs. Neither of these groups can legally coordinate their activities with candidates or campaigns. Super PACs must disclose their donors; nonprofits do not. Nonprofit groups can spend UNLIMITED dark money. Each state has its own disclosure laws. Want to know more about the laws in YOUR state? Our partners at the National Institute for Money in Politics created this handy scorecard. 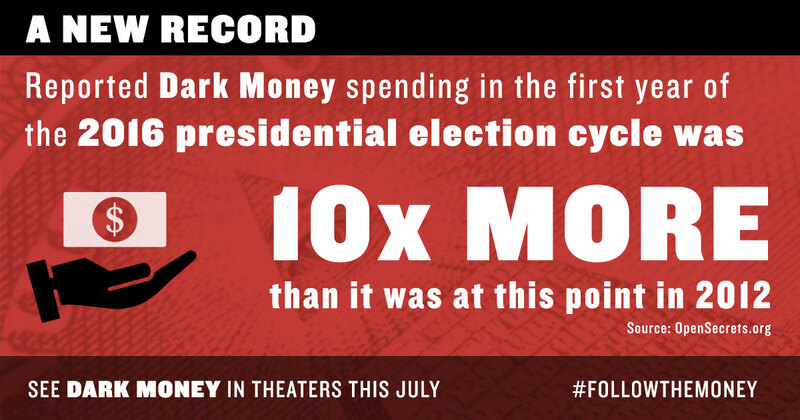 In theaters this July, DARK MONEY examines one of the greatest present threats to American democracy: the influence of untraceable corporate money on our elections and elected officials. But the citizens of one state won’t allow their democracy to be dismantled without a fight. You can join them. No screening scheduled in your town? Organize your own; we’re here to help. Investigative journalists around the country are holding our elected officials accountable by following the money on your behalf. Subscribe to your local paper. Support your local nonprofit press. Stay on top of breaking news from our partners at OpenSecrets.org, Maplight, and the Center for Public Integrity. Let politicians know that you oppose dark money by casting your ballot for candidates who reject dark money campaign donations. Register to vote and VOTE. Tell your friends about the influence of dark money in politics and share content from our social toolkit to help raise awareness about the film and the issues it exposes. If you use Facebook, share our trailer. Speak up when you think your state’s disclosure laws are being violated. Is your mailbox filled with campaign flyers making OUTRAGEOUS claims? Contact your state disclosure board and ask them to investigate. We need them to expose dark money! Work with our partners to maintain existing disclosure laws and VOTE when the issue is on the ballot. Small donor elections programs allow candidates to run solely with the backing of the voters they hope to represent — and not wealthy special interests. Visit our partners at Every Voice to learn more. Help the 28th Amendment reasserts that “We the People” govern this country — and not big $$$. A number of our partners — listed below — are working to get this amendment and can help you to get involved. Get involved with and consider supporting the good work of groups across the country who are working to shine a light on dark money. Follow us on Twitter and Facebook to stay on top of updates about their work. #followthemoney. Do you want to work with us too? Let us know. American Promise brings Americans together to win the 28th Amendment to the U.S. Constitution to secure fair elections, effective representation of the people, and a republic where we citizens - not money, not corporations, not special interests - govern ourselves. The Brennan Center for Justice is a leading intellectual force in developing policies that ensure everyone has a real chance to have their voice heard. The Campaign Legal Center advocates for passing and enforcing strong campaign finance reforms that help guarantee a democracy responsive to the people. The Center for Political Accountability shines a light on corporate political spending, and works to improve transparency and accountability, and ensure that companies act in ways that are in accord with the values of their shareholders and the principles of our nation. Citizens Take Action is committed to getting big money out of politics and strongly supports a constitutional amendment to overturn Citizens United and restore government that truly works for We The People. Common Cause is working to build a democracy in which every voice is represented, not just the voices of a few, wealthy special interests. The Democracy Initiative is network of 69 civil rights, environmental, labor, and civic organizations formed to restore the core principles of democracy and political equality — including fighting big money in politics. Every Voice wants to restore balance to our political system, so regular people are heard and represented, regardless of how much money they have. They design, support, and win small-donor elections programs at all levels of government across the country. Move to Amend is a coalition of organizations and individuals working to pass an amendment to the US Constitution to unequivocally state that inalienable rights belong to human beings only, and that money is not a form of protected free speech under the First Amendment and can be regulated in political campaigns. The National Institute on Money in Politics tracks campaign finance data and makes it available to news organizations and others to enable you to #followthemoney. OpenSecrets.org is the most comprehensive nonpartisan resource for federal campaign contributions, lobbying data and analysis available anywhere. Represent Us brings together conservatives, progressives, and everyone in between to pass powerful anti-corruption laws that stop political bribery, end secret money, and fix our broken elections. Take Back Our Republic counters those who seek to buy political favor by educating and engaging the citizens of this great land who are both disenfranchised with and disgusted by the entire political process. The Institute for Nonprofit News provides education and business support services to their nonprofit member organizations and promotes the value and benefit of public-service and investigative journalism. MapLight reveals the influence of money in politics, informs and empowers voters, and advances reforms that promote a more responsive democracy. Solutions Journalism Network works to spread the practice of solutions journalism: rigorous reporting on responses to social problems. They seek to rebalance the news, so that every day people are exposed to stories that help them understand problems and challenges, and stories that show potential ways to respond. The Voters’ Right to Know Project is a nonpartisan effort to advance effective policy surrounding the transparency of money in American politics. For more information, visit vrtk.org. The impact and engagement campaign for Dark Money is made possible through support from David and Linda Cornfield.